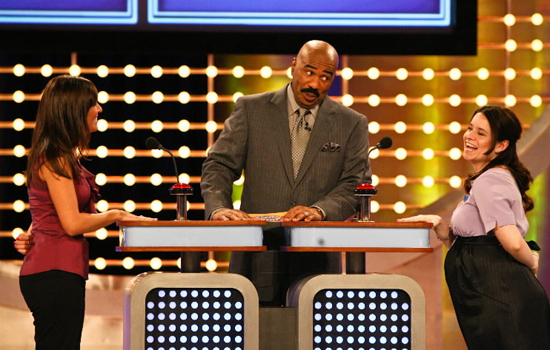 In a press release, NBC announced today that the “Family Feud” game show host Steve Harvey will have his own talk show on the network’s Fall 2012 schedule. It seems that the show will take full use and advantage of Harvey’s open candor and straight-forward attitude as well as his celebrity contacts by placing him on a stage where he can use these traits on an extreme variety of guests. Most likely everyone from everyday people to uber celebrities. Topics of the show are said to be marriage, dating, parenting, workplace, friendship and “the daily dramas we face throughout our lives” which are all of the above. No word yet on when filming will start and if Harvey will be leaving the “Family Feud”. Talk show shooting schedules are some of the most rigorous. Requiring three to four days of filming for typically about seven to eight months out of the year. If Harvey were to stay on Feud then that would leave him with approximately zero months of down-time. More details to report as we get them.